Filipinos love grand and colorful festivals that truly showcases the culture and pay tribute to its history, religion, culture and traditions. Travelers from all over the globe tour the Philippines not only to experience its stunning beaches and scenic sights but also to witness the country’s renowned festivals that present new meaning to festivity, feasting, dancing, music, and eccentric parades. Of course, these spectacles are also a place for a showcase of various cuisines and produce only in the Philippines. 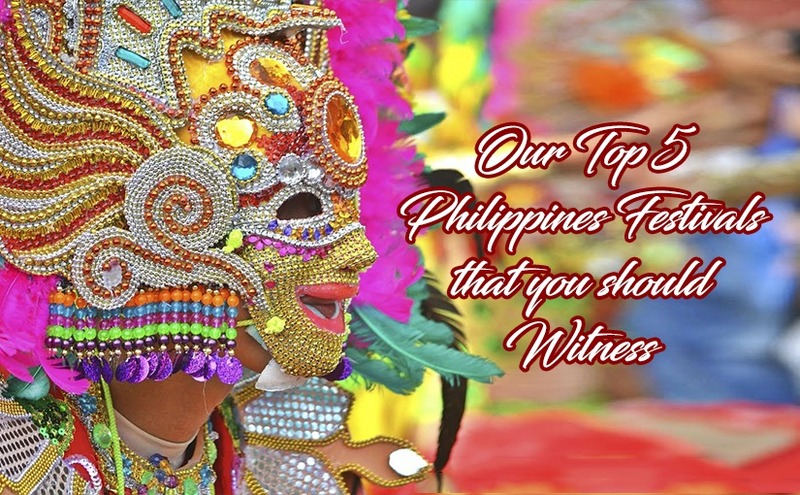 Today, we give you our top 5 picks of the Philippine festivals that you should witness on your visit. The Ati-atihan festival is celebrated on January 9 to 15 at Kalibo, Aklan. Experience a memorable thrill as you see revelers masquerading as “Negritos” in colorful attire, swinging and dancing while pounding tribal drums and chorusing “Hala Bira!” This festival is in preparation for the Sunday parade in an account of the Santo Niño or the Infant Jesus Christ. In Cebu City on January 15, the Queen City of the South celebrates the Sinulog Festival where you get to experience this fiesta for Cebu’s patron saint – Santo Niño. It is a week long celebration and is a local variant of the Mardi Gras experience. It is noted for its processions, parties, and performances. Then, it climaxes with spirited street dancing, powerful drum beats, and parades. The Dinagyang Festival happens on January 24 at Iloilo City. The pride of Iloilo City! It is absolutely a perfect feast to feed your senses. Each 4th Sunday of the month of January, the festival converts the city of Iloilo into a grand street party with massive and towering boom boxes and flooding with drinks and sumptuous food. The city will host a very contentious street dancing competition that highlights tribes that are rendered by various high schools and barangays contenders. On the period of February 1 to March 5, the city of Baguio holds its Panagbenga which is reaped from the Kankanaey word that symbolizes a season of flowering. And with its assorted parade of eye-catching flowery floats and kids costumed as fauna and flora. It absolutely lives up to its claim and billing, presenting the city of Baguio as the great travel target for all folks. The City of Smiles – Bacolod City holds its Masskara Festival on October 19. It is a frolic in Sugarland as others call it where the revelers dress in colorful attire and masks that are gaudily-decorated. It’s a surprise for art buffs, photographers and the travel aficionados who are looking for fascinating experience and scenes to capture. You will surely be leaving the city with a beautiful smile! ← What’s the Good in Buying Handcrafted Products?